Although this book was writen for women who are abused by men, men may benefit from it too. Your wife may not be boxing you, but she may be abusing you in other ways: underming your ego, divorce and squandering your assets or jumping on your balls. A potential abuser of women can be spotted in even the earliest stages of a relationship. The problem is, not enough women are educated about domestic abuse and many fail to notice the signs and symptoms of verbal, physical, or sexual abuse. Being able to recognize these telltale signs, and knowing what she can do to protect herself, can save a womans self-esteem, mental health, and even her life. 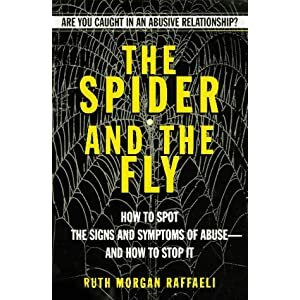 After its self-tests, case studies, and sample dialogue help women identify if their relationships are abusive in any way, The Spider and the Fly then outlines with caring and true understanding the choices women have. Written in non-threatening and non-judgmental language, The Spider and the Fl y teaches potential victims how to get out before its too late, and those already battered how to leave while maintaining their safety, the well-being of their children and their legal rights. Section II: Its Up to You to Decide What You Want. How Do You Do That? Have You Decided You Could Use Some Help? How Do You Find It? What Can You Expect If You Decide to Contact a Shelter or a Ho tline for Battered Women? Alcohol: Your Use and His--What Does It Do to Your Relationsh ip? Surprising Grief: How Do You Keep It from Pulling You Back in to the Relationship? Appendix: Resources: Where Can You Call for Help?